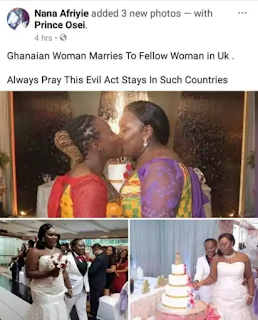 This photos showing yet to be identified Ghanaian lesbians tying the knot at their wedding which took place in Holland has gone viral on social media. According to unconfirmed report,suggests that the two love birds got married in a private ceremony in Holland. One of the photo show the ladies beautifully dressed in Ghanaian made kente while another also show the ladies dressed in their white wedding apparel. 0 Response to "Ghanaian Lesbians Share A Kiss At their Wedding In Holland (Photos)"